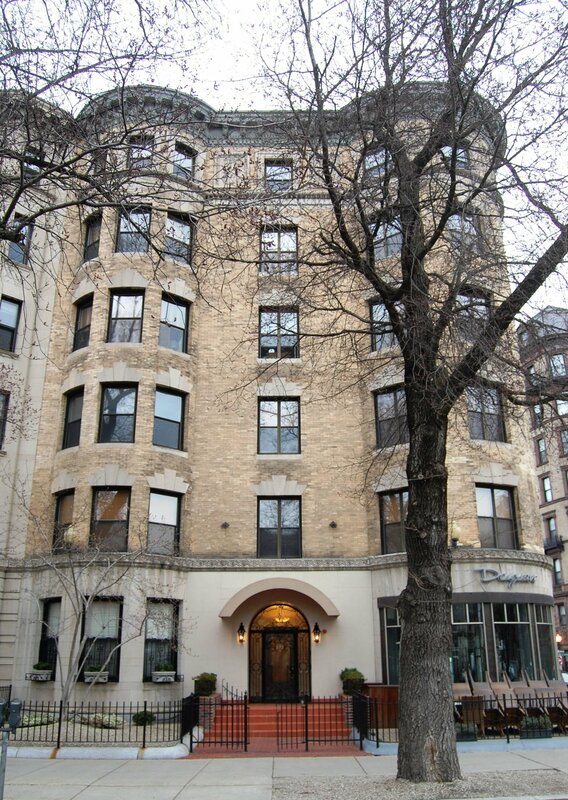 371 Commonwealth (61 Massachusetts Avenue) is located on the NW corner of Commonwealth and Massachusetts Avenues, with 355 Commonwealth to the east, across Mass. Ave., 373 Commonwealth to the west, 51 Massachusetts to the north, across Alley 905, and 370 Commonwealth to the south, across Commonwealth. 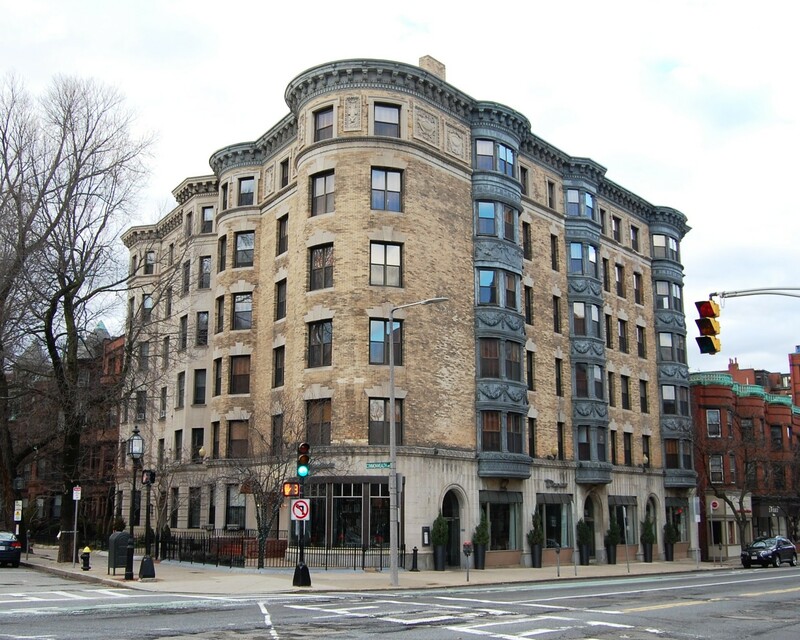 371 Commonwealth (57-59-61-65 Massachusetts Avenue) was designed by Mackay and Dunham, architects, and built in 1892-1893 by Keening & Strout Brothers, masons, for real estate developer and investor Albert Geiger. It was built as a six-story apartment house, The Chesterfield, with two stores on the street level and five apartments on the upper floors. 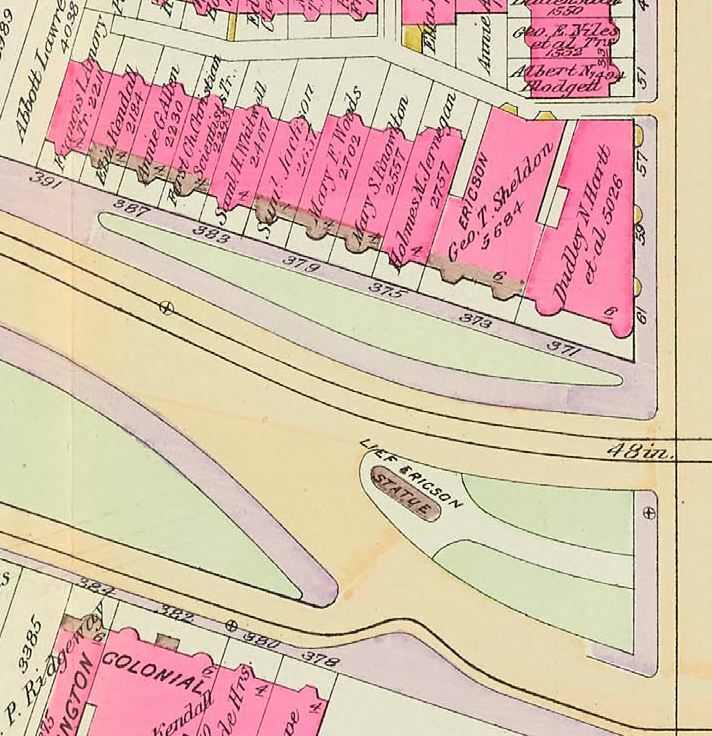 Albert Geiger is shown as the owner on the original building permit application, dated November 19, 1892, and on the final building inspection report, dated November 20, 1893. Albert Geiger acquired the land for 371 Commonwealth on November 14, 1892, from Augustus F. Arnold, a bookkeeper with the real estate conveyancing firm of Kern & McLoud. Augustus Arnold had acquired it the month before from Henry Lee, H. Hollis Hunnewell, and Augustus Lowell. It was part of a larger parcel that Henry Lee and his partners purchased on February 20, 1883, from a real estate investment trust formed by Grenville T. W. Braman, Henry D. Hyde, and Frank W. Andrews. The parcel was one several tracts of land the trust had purchased from the Boston Water Power Company on March 1, 1872. 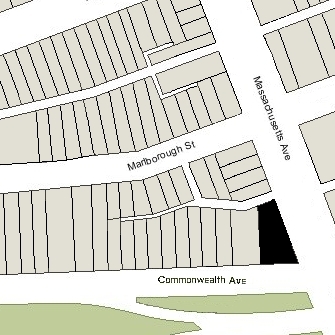 Click here for an index to the deeds for 371 Commonwealth (61 Massachusetts Avenue), and click here for further information on the land west of Massachusetts Avenue between the south side of Beacon and the north side of Commonwealth. On November 1, 1893, 371 Commonwealth was purchased from Albert Geiger by Alfred William Hartt for himself and as guardian for his two younger brothers, Dudley Nickerson Hartt and John Philip Hartt. They were the three surviving children of John Francis Hartt, a ship chandler and former boot and shoe dealer, and Emma Louisa (Nickerson) Hartt. John and Emma Hartt had been killed in a railroad accident in Chicago on April 11, 1889, along with their son, Robert Winslow Hartt. Alfred Hartt was a landscape architect and would later become a trustee. He married in June of 1895 to Augusta Gore Batchelder. After their marriage, they lived in Brookline. Dudley Nickerson Hartt graduated from Harvard in 1902. He became a wool dealer and,. in 1906, he purchased a sheep ranch in Montana. He married in October of 1908 to Katharine Menzies Barbour. After their marriage, they lived in Meagher County, Montana, and later in Brookline and in Cazenovia,New York. John Philip Hartt became an insurance broker. He married in March of 1910 to Millicent Harwood Lawrence. After their marriage, they lived in Salem, Massachusetts, and later in Dedham and Manchester, Massachusetts. 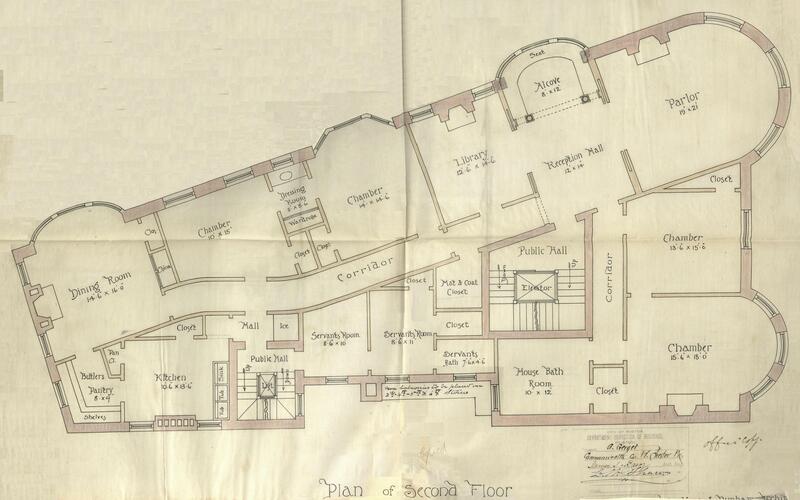 On January 22, 1924, 371 Commonwealth was damaged by a three alarm fire which started on the fifth floor. On February 21, 1924, 371 Commonwealth was acquired from the Hartts by Mary Margaret O’Brien. She was a secretary in the real estate office of Jacob Lebowich and probably held the property on his behalf or on behalf his brother, Samuel L. Lowe (Lebowich), also a real estate dealer. In June of 1925, she filed for (and subsequently received) permission to remodel the retail stores, installing new windows and doors. The building remained two stores and five apartments. In November of 1925, Mary O’Brien married to Edward Aloysius Mulvey, credit manager for a leather company and later treasurer of the Pilgrim Cooperative Bank. After their marriage, they lived in Cohasset. In April of 1927, Samuel Lowe filed for (and subsequently received) permission to convert the property from apartments into medical offices. The building subsequently was known as the Pasteur Building. On October 9, 1934, Frances O’Brien transferred 371 Commonwealth to Catherine Hassey. She was a secretary in a real estate office. probably the office of Samuel Lowe. She married in 1937 to Andrew J. Sullivan. On December 3, 1943, Catherine (Hassey) Sullivan transferred 371 Commonwealth to Maurice Levine, and on November 15, 1945, he transferred the property to Samuel Lowe’s wife, Carolyn. On June 1, 1955, 371 Commonwealth was acquired from Carolyn Lowe by Dr. Robert B. Gorsey, a dentist, and his wife, Lena (Garber) Gorsey. They lived in Newton Centre. Robert Gorsey died in July of 1956. On November 18, 1958, 371 Commonwealth was acquired from Lena Gorsey by the Mystic Lakes Realty Corporation, and on November 24, 1958, it was acquired from Mystic Lakes Realty by the R. S. R Realty Company, Inc., owned by Richard S. Robie. He was a real estate dealer, automobile leasing company operator, and president of the John S. Powers Schools. In December of 1961, he filed for (and subsequently received) permission to remodel the interior. The application indicated that the proposed use would continue to be offices. 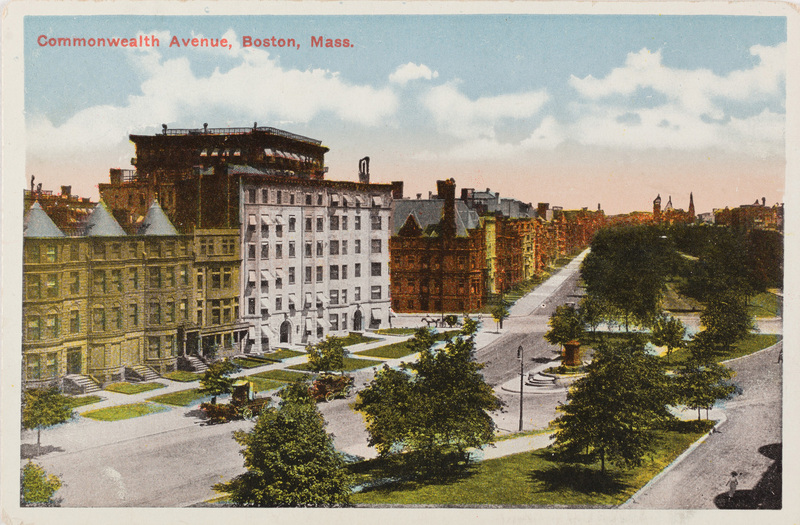 On April 25, 1962, 371 Commonwealth was purchased from R. S. R. Realty by real estate dealers Moses I. Richman and Harold A. Richman, trustees of the 371 Commonwealth Avenue Trust. In June of 1962, Moses Richman filed for (and subsequently received) permission to convert the third through sixth floors from offices into lodging units. In February of 1963, he filed for (and subsequently received) permission to install an entrance canopy extending 18-½ feet from the front of the building. On March 16, 1967, 371 Commonwealth was acquired from Moses and Harold Richman by the Capitol Finance Corporation. 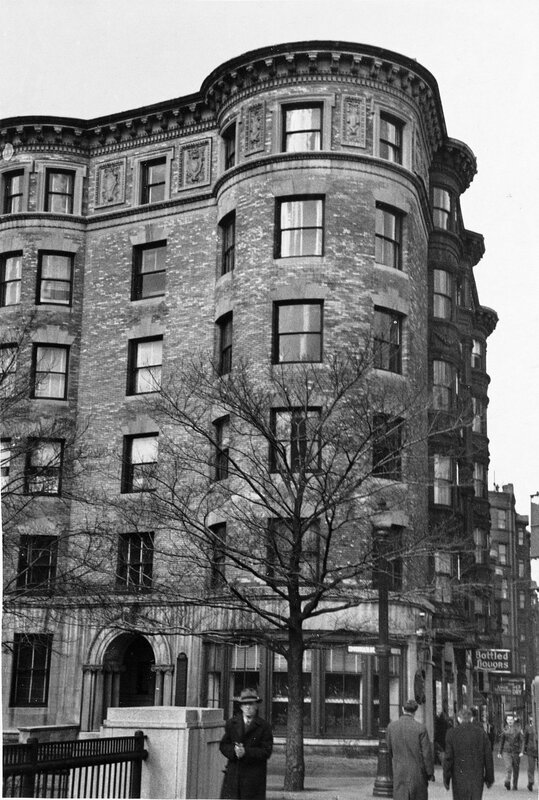 On April 6, 1967, Capitol Finance transferred the property to its president, Allyn Louis Levy and to the Jane & Steve Levy Partnership, composed of two trusts for the benefit of Allyn Levy’s children – the Jane E. Levy Trust and the Steven P. Levy Trust – of which he and Jason Poster were the trustees. On January 15, 1968, 371 Commonwealth was acquired from Allyn Levy and the Jane & Steve Levy Partnership by Edward H. Mank, trustee of the New England Real Estate Equities Trust. In 1971, Walter Bauke purchased 371 Commonwealth from the New England Real Estate Equities Trust. When he purchased the property, its legal occupancy was three retail stores, two offices, lodging house with 45 rooms, and two apartments. On June 9, 1971, 371 Commonwealth was purchased from Edward Mank by Walter Bauke. When he purchased the property, its legal occupancy was three retail stores, two offices, lodging house with 45 rooms, and two apartments. In October of 1971, he applied for (and subsequently received) permission to convert one of the three retail stores into a restaurant with take-out service. On November 26, 1975, the South Boston Savings Bank foreclosed a mortgage given by Walter Bauke and took possession of the property, and on April 6, 1976, it was purchased from the bank by Ronald J. Carlow, trustee of the Ronbar Realty Trust. On June 29, 1979, 371 Commonwealth was purchased from Ronald Carlow by real estate dealer Charles C. Patsos, trustee of the 371 Commonwealth Trust. In October of 1982, Feliciano Petruzziello succeeded Charles Patsos as trustee of the 371 Commonwealth Trust, in February of 2001, Gloria Petruzziello succeeded Feliciano Petruzziello as trustee, and in April of 2006, Gina Petruzziello succeeded Gloria Petruzziello as trustee. 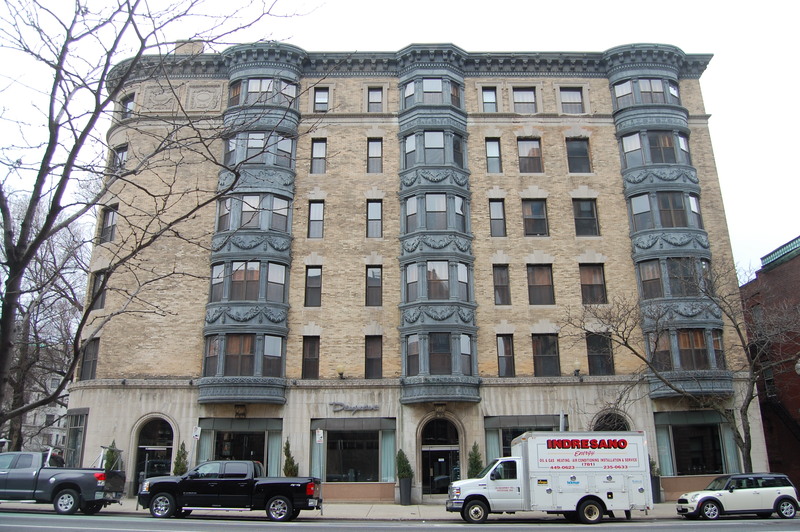 371 Commonwealth remained a combination commercial and residential building in 2018, with a restaurant on the street level at 57-65 Massachusetts Avenue, and a lodging house, two apartments, and two offices on the upper floors. Over the years, a number of commercial tenants occupied the retail store spaces at 57-61 Massachusetts Avenue. Longer-term commercial tenants included Hoffman florists, located at 61 Massachusetts Avenue from about 1916 until the mid-1950s, and Fennell’s Liquors, located at 59 Massachusetts Avenue from 1938 until 1992. In the 1990s, the corner retail space at 61-65 Massachusetts Avenue was Baci’s restaurant. It closed in about 1998, and by 2000, the space had become The Seasonal Table, a retail food store that also sold beer and wine. It subsequently closed, and the space was once again used for a restaurant, with the space expanded into the former retail stores at 57-59 Massachusetts Avenue.